EdTechTeam South Africa offers a range of professional development experiences for teachers, administrators and school staff. Led by Alister Payne and Kevin Sherman, and supported by a talented team of educators from across South Africa, our professional development offerings include EdTechTeam Global Summits featuring Google for Education, as well as Google Certification Masterclasses for educators and schools. It’s an edtech conference, but not as you know it! An EdTechTeam Summit is an unforgettable minds-on, hands-on learning experience that gives you practices you can immediately implement in your classroom. You can expect inspiring speakers and presenters, a well as amazing workshops that help you really understand and apply technology while keeping education as the focus. At each year we offer fun new twists—like the Google Playground and Breakout EDU—not to mention awesome prizes and great food. This is Professional Development like you never experienced! If you’d like to bring a Summit to your area, let us know. We’d love to partner with you to make one happen at your school. If you know it, why not prove it? Google offers several certifications specifically for educators and EdTechTeam South Africa can help you prepare for, and take the certification exams. Our team of Google for Education experts can help you learn what you need to know to pass the first time. Every one of our trainers is certified, so we know exactly what you need to succeed. 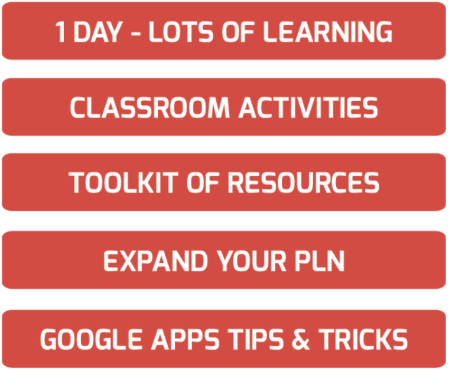 If you are looking to earn your Google Certified Educator badge, the Level 1 mastercourse is a great place to start! We will cover all the essential skills including Google, Drive, Docs, Slides, Sheets, Forms, Calendar, and Classroom. The coursework focuses on practical tasks that will make you feel more confident using this amazing set of tools. This course includes a voucher to take the exam. Contact [email protected] today to host one of our Masterclasses at your school or to learn about a Masterclass near you.